​Bed bugs are small wingless parasitic insects. Adults measure an average size of 5-6mm and also resemble the size and shape of an appleseed. A female can lay up to 500 eggs over the period of her lifetime where eggs will hatch in an average of 10 days. 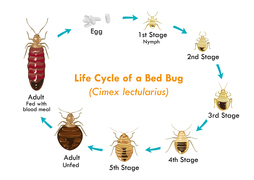 Bed Bugs develop through gradual metamorphosis where there are 5 nymphal stages. They need at least one blood meal to develop to the next stage of maturity to become an adult bed bug. Similar to mosquitoes, bed bugs inject an anesthetic when biting so that they can achieve a blood meal that goes unnoticed by the host. They are often found in and around areas where a human will rest for an extended period of time. Common areas include: the mattress, boxspring, headboard and couch. They will gravitate to the areas where you sleep or rest as they are attracted by the CO2 that you breathe. Bites can form a raised, reddish welt on your skin that may itch for up to a week however, some people may not react in this way. People react differently to bed bug bites, some may develop scars, some may become itchy and some may not develop any marks at all. Bed bug infestations can be misidentified by carpet beetles, mosquitoes, fleas and mites. Although you may have encountered bites, this does not confirm that a bed bug infestation is present until evidence is found. Having a bed bug inspection completed by Gray Wolf Pest Control will help to confirm the presence of bed bugs. Bed Bugs can date as far back as 400 B.C as they have been mentioned in ancient Greece as well as many other times throughout history. It is believed that bed bugs may have originated in caves of the Middle East inhabited by bats and humans. A large decrease in activity was observed after World War II as rampant use of synthetic insecticides lead to almost complete eradication of the bed bug. The re-emergence of the bed bug has come full force within the last 20 years and the reason for their return is widely debated, yet it is agreed that it is from numerous factors. Government regulations have caused discontinuance of many potent insecticides that were found to be very effective against the pest. Combined with the growing trend of global travel has caused them to spread quickly around the world. Bed bugs can easily be transferred and therefore it is important to understand some high risk activities that may cause this to happen. - Bringing infested furniture or clothing into your home. - Sleeping/resting on a bed or sofa infested with bed bugs. - Having guests over who have homes infested with bed bugs. - Leaving your belongings such as clothes or baggage's on the floor or furniture for several hours in an airplane, home, hotel/motel, movie theater, store, office, car, taxi, bus, train, hospital or building infested with bed bugs. Although you may keep your home clean, this does not stop bed bug infestations, bed bugs can be found in clean, dirty, small or big homes, vehicles or buildings. The transfer of bed bugs are commonly acquired by a chance encounter. Eggs or live activity of a breeding population may catch a ride back to your home on your clothes or belongings or someone else's clothes or belongings which causes the beginning of a bed bug infestation. A bed bug infestation can form by accident and it is not anyone's fault. However, there are certain measures that you can take that are highly effective in preventing a bed bug infestation from occurring. 1. Maintaining a clean and decluttered home. This will help to eliminate hiding spots for bed bugs. This may help you spot an infestation more quickly and will also help for a faster and easier treatment for complete eradication. 2. Having a licensed technician from Gray Wolf Pest Control perform a preventative bed bug treatment. Your technician will attack baseboards, furniture and all areas that bed bugs may potentially hide with residual product that will eliminate bed bugs on contact. Your technician will also install long-lasting and out of sight bed bug traps that will trap bed bugs coming to and from your beds/sofa also serving as a great monitoring device. By having a preventative treatment completed by Gray Wolf Pest Control, bed bug populations will be reduced and have trouble populating in your home this treatment will also increase chances of eliminating a bed bug population once it is brought into your home. We offer a warranty on our work, if a bed bug infestation occurs after our preventative treatment we will take the cost off our full bed bug treatment. A full bed bug treatment by Gray Wolf Pest Control combines our tools, products and experience to ensure for a successful solution to eliminate bed bugs. Since each home or building we treat is different, we approach our treatments differently by not relying on special formula to eliminate bed bugs in every home, building or vehicle. We use a combination of heat, steam, products and various other equipment to successfully control bed bugs. After assessment from a professional, we will illustrate our treatment plan and send a copy directly to you that describes our treatment and the preparation needed in order to successfully eliminate the bed bug infestation. Our bed bug treatments are highly effective and do not rely on excessive preparation to be done. All bed bug preparation will be explained upon inspection, you can visit the link below for a more detailed list of preparation.